There are only five major characters in Rang Birangi, but OH MY the convoluted things they get up to! Anita (Deepti Naval) and Jeet (Farooq Shaikh) are a cute young couple who haven't quite gotten around to getting married yet. Anita's adorable friends and the movie's compass for good sense.) Anita is the secretary of Ajay (Amol Palekar), who is so absored by his work that he has all but forgotten his charming wife Nirmala (Parveen Babi). 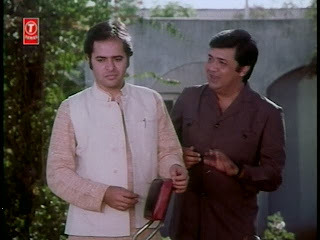 Her brother Ravi (Deven Verma) returns after an extended stay abroad to find Nirmala so upset about Ravi's neglect that he decides to set up a scheme to turn his attentions back to her (his "play," he calls it). Under the banner of needing to spice up his life, Ravi encourages Ajay to copy the plot of a recent Hindi film in which a boss woos his secretary by pretending he has a miserable home life. Ajay at first finds this ridiculous and claims he couldn't possibly flirt, but he eventually pulls off the ruse so effectively that we come to a song in which both Anita and Nirmala sing to him. Jeet gets jealous of all the time Anita spends with Ajay, but when Anita tells him her side of the story, he recognizes the movie plot and tells her she's been had. Furious, she tells Nirmala what's going on. Nirmala then figures out it's her brother who instigated all of this, and after he explains his noble intentions, they set off on a plot for her to punish Ajay. Meanwhile, this experience has convinced Anita that all men are slime and she can no longer trust that Jeet will be honest with her in their future. Frustrated by her doubt, Jeet tells Ravi of his woes, so Ravi cooks up a third plan, this time to make Anita jealous over a fictional girl from Delhi. to tell Ajay that Anita is really the daughter of a famously tempermental boxer who will be none too pleased if their dalliance does not lead to marriage. Anita plays along, crying to Ajay that her father will kill her if he doesn't marry her. 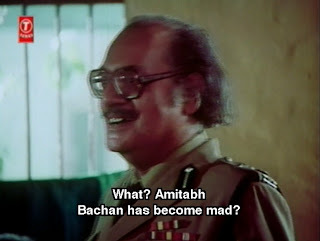 But little does Ravi know, Nirmala is old friends with the real Dhurandar Bhatawadekar (a fabulously grumpy and unamused Utpal Dutt), so when Ajay tells her that he's being blackmailed by Bhatawadekar, a light goes on in her head. She tells the real Bhatawadekar that he's being impersonated by a blackmailer, so the real Bhatawadekar arrests the fake one, and to get him out, Ravi pretends...oh my god, I have to stop now. It's exhausting, isn't it? 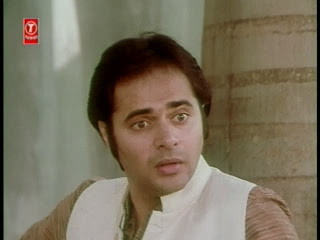 After watching Rang Birangi the first time, I thought it flirted too long and too close with Really Stupid Ideas - the kind of thing that I would run screaming from if Priyadarshan did it but that was cute enough in the hands of Hrishikesh Mukherjee, though still nothing really to write home about. But then I read a post on Passion for Cinema that explains Mukherjee was actually poking fun at the plot of another film, B. R. Chopra's Pati Patni aur Woh, and making an extended joke about how that kind of plot only works in movies, and I said "Ohhhhhh!" and liked it more. On re-watching it, I realized that Ravi actually says as much at the end, but for some reason I hadn't taken him at his word and had assumed that the reference was only to a fictional movie. I will be wearing the DUH hat for the next week. Taking another movie's plot and doing something funny with it, such as following its implications through, is a Beth Loves Bollywood-approved idea for a comedy. Even knowing that, though, I found Ravi annoyingly puckish and couldn't understand why any of these people would decide to follow his ideas. "I am the director. You are all the puppets and you will dance as I tell you to," he says, but why they repeatedly go along with it is not really clear. It's in the script, I guess - and maybe Mukherjee is poking fun at that sort of convenience, too, perhaps with Anita, Jeet, and Ajay (Nirmala doesn't totally fall for the tricks) as representatives of us, the gullible but ever-hopeful, ever-game audience? 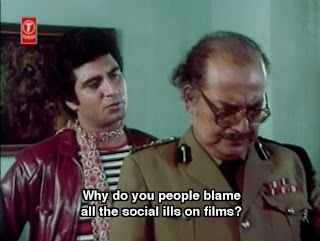 Bhatawadekar, the authority figure and potentially wise elder, blames films for sending society's morals down the toilet. 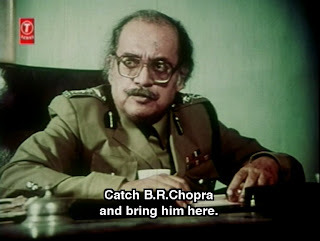 He too has a poor grasp on what is fiction and what isn't - his constables mistake a film shoot for an actual assault and try to protect Bindiya Goswami from Raj Babbar - and I like that Mukherjee is teasing both people who take films literally as directions for living and those who assign them too much power as a cultural force. 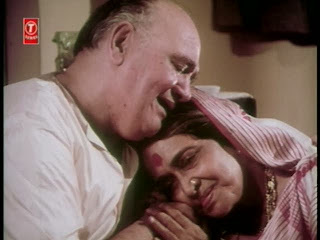 It's maybe unfortunate that the first of Mukherjee's films I saw was Chupke Chukpe, because it's hard to imaigne liking any as much as that one, but both Rang Birgani and Guddi have impressed me. Overall, I suspect this film comes off as much cleverer if you know what it's riffing on. Without that context, I found it pleasant and amusing but a little tiresome - not bad, and not sloppy, but basically just a time-pass. With that context, though, I had a new way to see it, and that extra information helped keep my patience in tact during some of the more extended scenes of wacky misunderstandings and, to call a spade a spade, outright lying. I found it much funnier the second time around - and with a little bite here and there, too. Knowing the context still does not make the film as pleasant as Chupke Chupke (or Guddi)! I know what Mukherjee is trying to do and the shenanigans would have been funny if the adultery plot had not really spiced up a boring marriage. He sets out make fun of a cliche and ends up by enforcing another one - an adulterous (if platonic) affair spices up married life. So, while funny and fun in most parts, it still does not add up to a great movie in my book. bollyviewer - That's a fantastic point. It was frustrating that the Really Stupid Idea did in fact work as it was supposed to. I suppose the filmmakers might argue that "nothing really happened" between Ajay and Anita - platonic, as you call it - but to me it did read as emotional adultery. I really really hate Pati, Patni Aur Woh. It's a Red Mist movie. Do not watch it under any circumstances! Or, if the Really Stupid Idea works, it's okay, but it has to have some other twist to offset that fact. I've yet to delve into Mukherjee's films, but I'm looking forward to it. Beth, thanks for reminding me that I'd seen this a few months ago when we were trying to see every Farooq Shaikh/Deepti Naval film. Although it was clear that the movie was about the collision between filmi fantasy and reality, it seems much funnier now that you've figured out the meta-references. 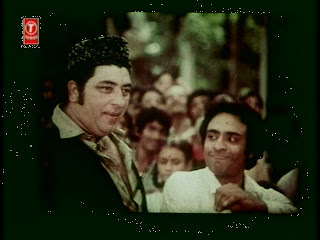 Still, in my estimation it's a lesser film in the Farooq/Deepti pantheon than either Chashme Budoor or Katha. 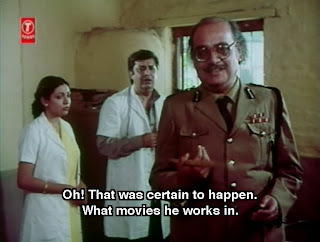 A reasonably pleasant time-pass--it's Hrishikesh Mukherjee, after all--but the whole "director dictating to his players" aspect became (in my view) somewhat tiresome. Thanks, though, for giving me a new perspective on the film. Ah, I forgot to mention: have you heard the swirling rumours that David Dhawan has been approached to re-make both/either Chasme Buddoor and Chupke Chupke. Wait -- what's that screaming sound I hear? That said, neither this one nor Pati Patni aur Woh are among my favourite films. 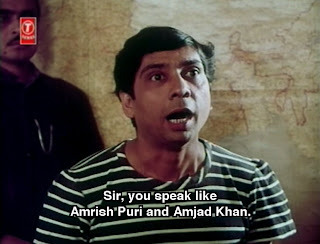 Rang Birangi is certainly better than PPAW (mainly because I like Utpal Dutt so much), but nowhere as good as Chashme Buddoor, Chupke Chupke, or - another of my favourites - Golmaal. Saw this movie over the weekend. Wont call it a great movie but it was a good timepass and hundred times better than the so-called-comedy movies that come these days.